Unless you're an electron, making measurements of one's mobile behavior will not change anything. So, why bother with a pedometer, or, in this case a spiffy super duper pedometer like a fitbit(.com)? 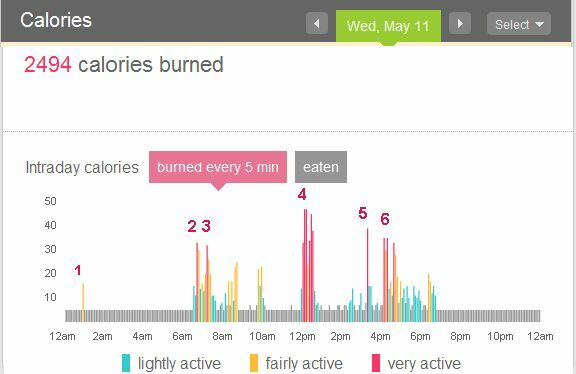 Depicted above is a chunk of data from the fitbit I obtained from yesterday. It measures step counts like any pedometer, my typical step is about 2,000 steps per mile. But, it also differentiates the steps in terms of lightly, fairly and very active. The very active steps are ones that burn the most calories per unit time. The data the company has gathered is published on their blog; they present persuasive data to validate their calorie count algorithm. My goal with this device was to figure out which types of my daily activities were efficient at burning calories and, most importantly, find activities that were - I hate the overuse of this word, but it's apt - sustainable. I was seeking activities I could carry out every day without torturing my troubled musculosketal system. 1 = This was me having fallen asleep on the sofa and walking to bed. This was recorded as fairly active - not sure why. It's all part of teasing out the algorithm. 4 = brisk walk (ca. 140 bpm heartrate) to the grocery store and back, about 30 min. I am still and will be for a while, pondering the data. I think a simple vigorous walk during the day is probably the best activity for me, almost as good as a horrid stationary machine, yet it fits into my busy life. I still want a gradual decrease in weight to validate this. I didn't mean for this to sound like an endorsement for the fitbit, but it is a cool device to glean lots of information about your daily activities.